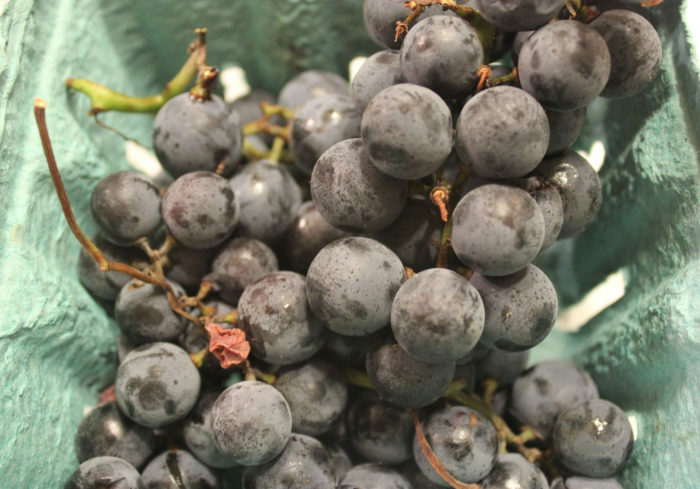 Fall is the time for the all too short Concord Grape season. Unlike other grape varietals, this is a New England specialty that is on our store shelves for just a few weeks. When they appear, it is imperative to enjoy them every way possible. This syrup is lovely poured over ice cream, or pound cake, or angel food cake. Or you can make a Concord grape soda, an idea included in the preparation instruction below. Once you’ve become addicted to Concord grapes, you are sure to think of fall as your favorite season. It is mine, and this is one reason [football is the other!]. Place the grapes, sugar, the ⅔ cup water, and lime juice in a saucepan. Bring to a boil over medium heat. Decrease the heat and simmer, uncovered, for IO minutes, stirring occasionally. Remove from the heat, let cool for IO minutes, and stir in the orange flower water. Place a strainer over a bowl and pour the grape mixture into it in manageable batches, using a wooden spoon to mash the mixture against the mesh of the strainer. Discard the seedy mash that remains in the strainer. Let the syrup cool to room temperature and chill before using. Store the syrup in covered glass jars or plastic containers in the refrigerator for up to 2 weeks, but watch it, grapes do ferment! The syrup may also be frozen in plastic containers for up to 3 months. If frozen, allow to thaw in the refrigerator overnight before using. To make a Concord grape soda, fill a 12-ounce glass halfway with ice, add ¼ cup (2 ounces) of Concord Grape Syrup, top with seltzer, and stir gently with a soda spoon to combine.